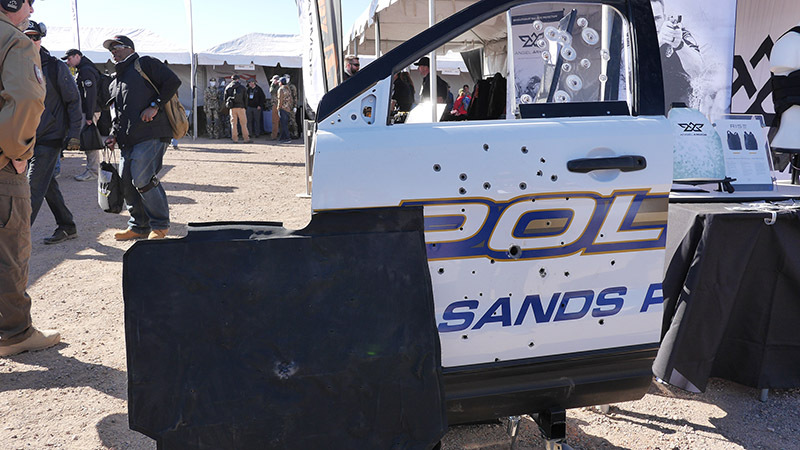 SHOT Show’s Industry Day At The Range provides an unique opportunity to try out new products that will appear on the SHOT Show floor later in the week. 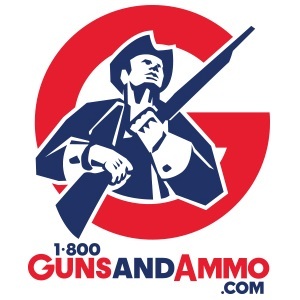 This annual event is held at the Boulder City Rifle and Pistol Club outside of the Las Vegas metro area. 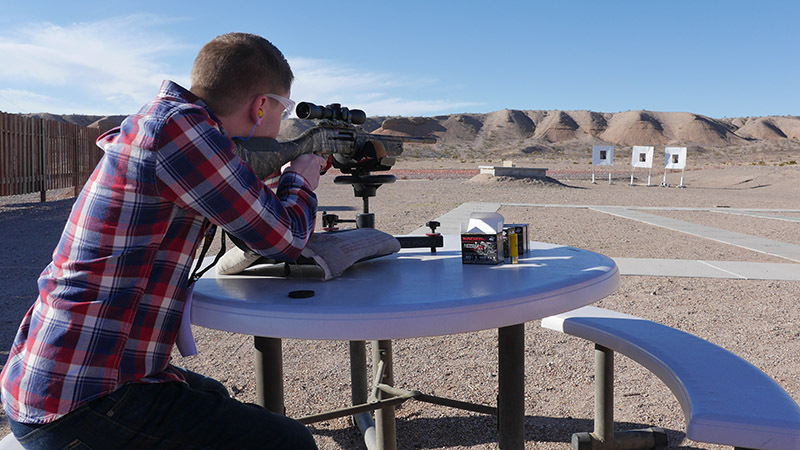 The range provides picturesque views of the surrounding desert and mountains as well as plenty of space to hit paper targets, bust clays and plink at metal targets. The weather isn’t always cooperative, and a steady desert wind always blows through the range, but this doesn’t stop hundreds of visitors from attending. This year felt especially cold, and everyone who brought their parka was damn glad they did. 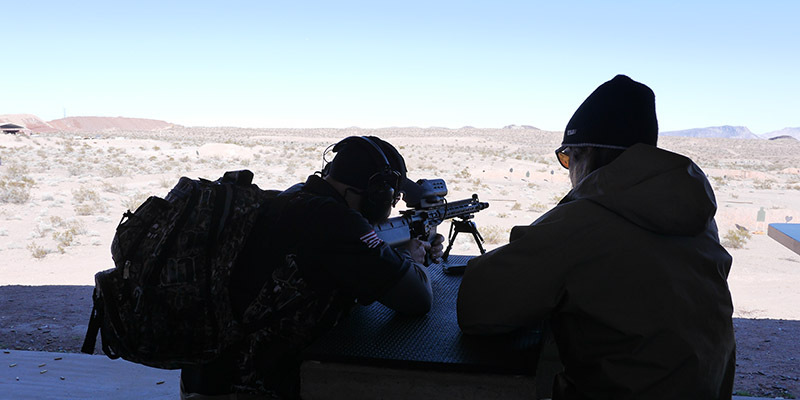 There is simply too much to digest for one person at Range Day, but here are some highlights from our day at the range. Up first, I checked in as contestant #001 at the Winchester Ammunition Still Target Challenge. This paper target competition is set at 40 yards with reactive paper turkey targets that light up orange or yellow depending on where you hit the bird. Up for grabs to the winner is a Winchester SX3 Long Beard 20 gauge shotgun, a Leupold VX-1 Muzzleloader/Shotgun scope and two cases of Winchester Long Beard shotgun shells. The Long Beard shells are new for Winchester this year, and they feature a hard resin injected around the shot pellets that holds them together. The heat of the shell expansion loosens the resin as the round is fired, and the result is an extremely tight pattern. At 40 yards through the scope it was plain to see the results after I shot my round. In the field, my shot would’ve been a kill, although 7 pellets in the brain and spinal cord regions likely wasn’t going to hold up as the winner of the day. However, I do know which turkey loads I’ll be choosing this year for my hunts. Up next, I had to check out the new Springfield Armory Saint, a rifle we’re currently running on special at 1800GunsAndAmmo. 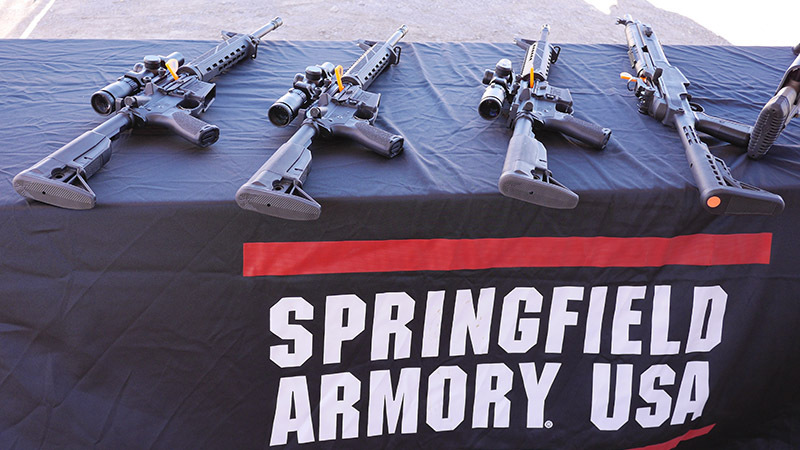 This is Springfield’s first entry into the AR-15 class, and the rifle is certainly worthy of the Springfield name. It is relatively lightweight, easy to handle and it has a nice, sleek look. The Nickle Boron trigger was especially nice and it really played well on the range, and the Bravo Company KeyMod handguard felt compact and was easy to handle. As far as sub $1000 ARs go, this is one I would certainly look at if I was in the market for a new rifle. The SilencerCo booth was a popular stop this year, and in addition to their great collection of silencers, bound to be even more popular with the upcoming Hearing Protection Act up for debate, I had a chance to finally use SilencerCo’s Radius Rangefinder system. Although this is not new for this year, it’s still a relatively fresh addition to the SilencerCo line and one well worth investigating. 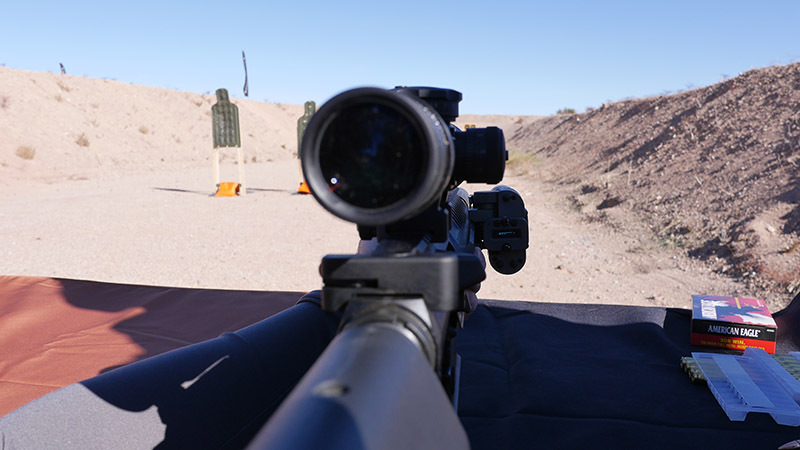 This device is extremely powerful, and it reads up to a mile on reflective targets. However, I had just finished up reading Tony Martin’s recent rangefinder review, and I was quick to ask how it performed on dark targets, which was a much more realistic 1000 yards. I found myself wondering how well it would perform even at that range, but I imagine it would do just fine in most sub 1000 yard scenarios. While it’s not the most compact device, it certainly makes up for that in a powerful constant ranging mode. In addition, the device provides two readings at once including a “likely distance.” If the intial reading is somehow flawed for whatever reason, you’ll be able to use the likely distance along with some common sense of your shooting situation to get a fairly accurate reading. It can be mounted either on the side of a rifle or above the scope for faster reference in time-shortened engagements. Technically not new for 2017, SilencerCo’s rangefinder still represents on of the best hunting solutions on the market today, and it’s even more fun on top of a rifle equipped with a SilencerCo suppressor. There is always plenty of browsing to be done, and something that caught my eye was Angel Armor’s car door inserts. These armored plates (soft armor) fit between your car door and can be installed with only five minutes of work. They represent an easy method of bulletproofing the doors of your automobile, and one look at the test car door makes it easy to see how effective the solution is. Angel Armor personal armor plates are impressive as well with solutions that are built to stop .308 rounds. 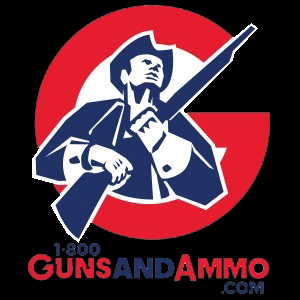 Finally, I had the pleasure of exploring the Range Day grounds with Swanson Media Group, and you can read many of their great articles right here on the 1800GunsAndAmmo Blog. They’ve put together a good team of writers, photographers and film makers, and it was great to see them in action documenting this year’s Industry Day At The Range. You can look forward to many more articles from their team in 2017 including a survivalist series on our sister blog 1800Gear.com. Checking out the Tracking Point system with Swanson Media Group.